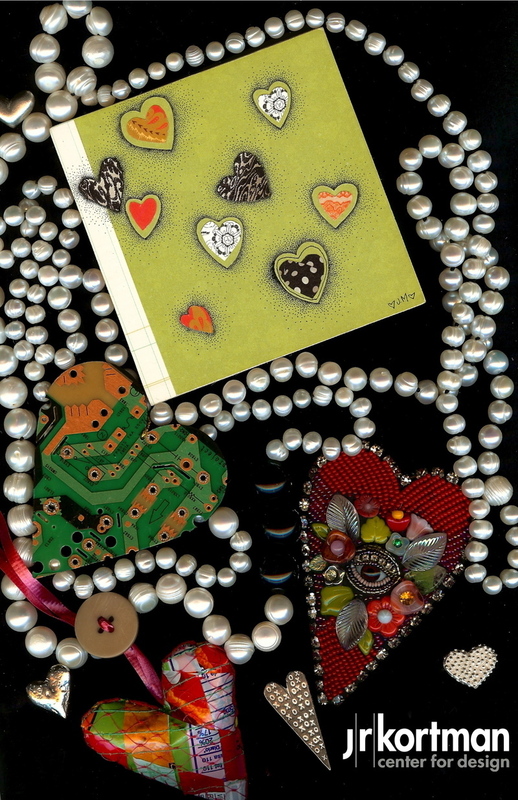 "Lucky in Love," mixed media art work by Jennifer Mullin, 70-inch freshwater pearl & onyx necklace, "motherboard" heart, recycled materials heart with button, "Eye Heart," beaded art work by Betsy Youngquist, and pewter pocket hearts by Vilmain. These and other sweet things now at J.R. Kortman Center for Design. Rockford artist Jennifer Mullin looks through magazines and is inspired by the home furnishings she sees. The found images become elements in her delicate and comfortable interiors she creates in her small-scale works opening Friday, February 4th in the Kortman Gallery. The exhibition titled “In My Place” features mixed-media new works by Mullin created with collage and pencil drawings resulting in colorful and seductive images of interior spaces. Mullin is a 1998 graduate of the University of Wisconsin Madison and currently teaches art at Boylan High School. 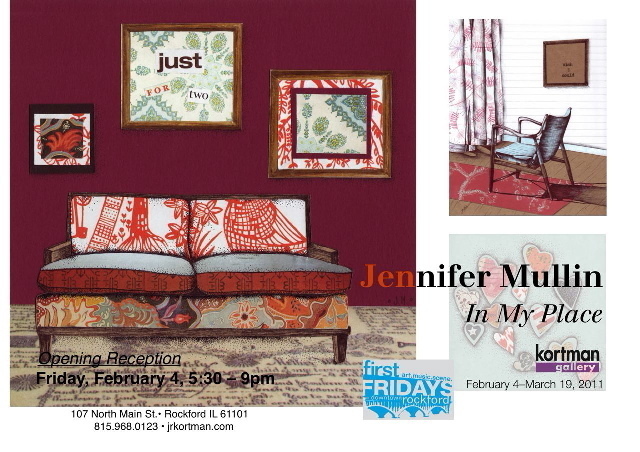 The opening reception for Jennifer Mullin’s “In My Place” will be from 5:30 to 9:00pm on Friday, February 4th in the Kortman Gallery, located upstairs at J.R. Kortman Center for Design, 107 North Main Street, Downtown Rockford. For more information call 815/968-0123 or visit www. jrkortman.com. When: Opening reception, Friday, February 4th, 5:30pm-9:00pm. Gallery open Monday–Saturday, 10 to 6pm. Exhibition runs through March 19th, 2011. Free admission. February 4th is also First Friday...Dennis Horton will be doing his bartending thing @ the Kortman Gallery Bar and we will revealing music from Anne O'Keefe's iPod! "What's on your iPod?" To see images of the Jennifer Mulin exhibition click on "Current Show" option to the left under Kortman Gallery on the J. R. Kortman website. Rockford's "Symbol," by internationally celebrated artist Alexander Liberman, soars in Sinnissippi Park along the east bank of the Rock River inspiring all who drive, bike, or walk by. This exciting piece of art is now available in a miniature 2-D metal "replica" which is not only a great souvenir, but can be used as a bookend, votive stand, or expressive decorative object. 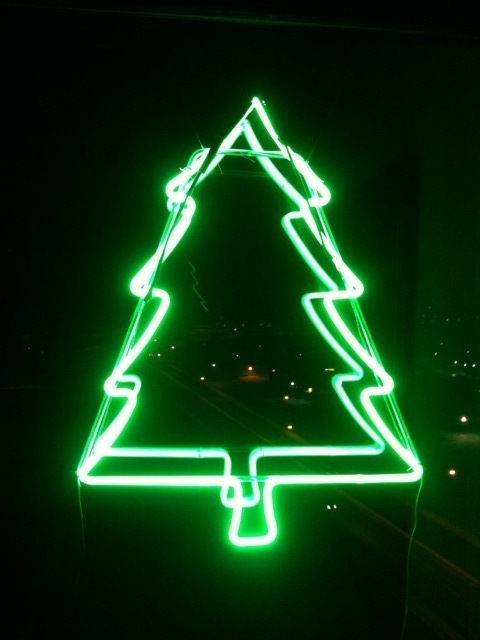 The small-scaled "Symbol", which also comes as an ornament, was designed by J.R. Kortman along with artist Ben Pettee who manufactured each piece in his North Main Street studio here in Rockford. The large "bookend" version is $20 and the small "voitve" one is $10. Our store window features these sweet little "Symbols" with an original maquette which was created by Mr. Liberman and sold as a fundraiser for the this world class sculpture. The maqeutte is on loan to J.R. Kortman courtesy of Roland & Louise Poska. Probably the most influential architect of the last century was Frank Lloyd Wright. J. R. Kortman celebrates his great design genius with a range of products from pottery to neck ties. A replica of "Flower in the Crannied Wall" statue designed by Wright and Richard Bock in 1902 for the Susan Lawrence Dana House in Springfield, Illinois is availble for $125. The distinctive pottery is made right here in Illinois at the Haeger Pottery Company in East Dundee. Lego fans will find the "Falling Water" and Guggenheim Museum kits both challenging and rewarding. And a "Concretus" paperweight ($32) will add a sophisticated accent to any desk top or coffee table. J.R. Kortman Center for Design...always fascinating. Hi! 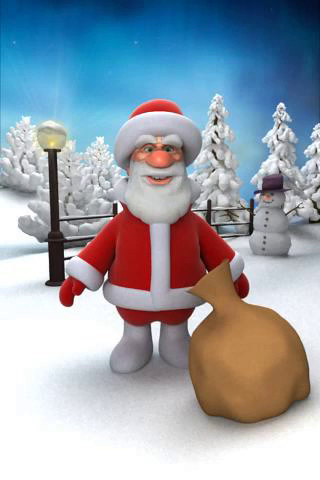 Hope your New Year is off to a great start. 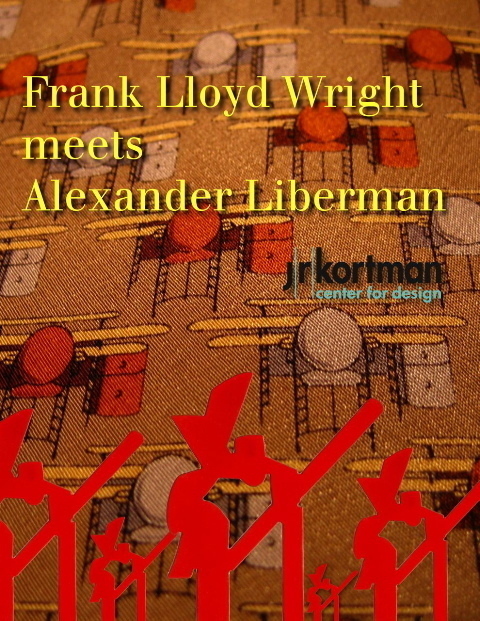 Continue the celebration by heading Downtown for First Friday @ J.R. Kortman Center for Design. The store will be open 'til 9 and the gallery bar will be open at least 'til 9 or later, so we can party like it's 1999 or 2011...whichever is more fun! 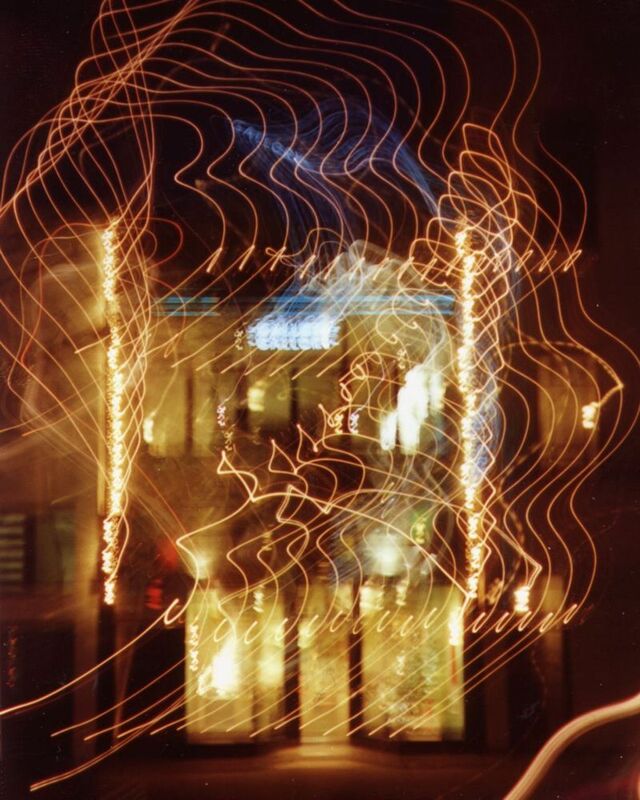 Dennis Horton will be mixing up fun upstairs in the bar...and music?... we will reveal the personal, at random, unedited playlist of Chris Wachoviak's iPod. 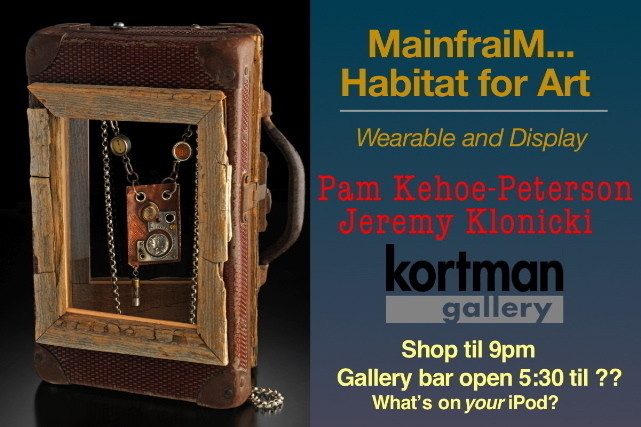 "MainfraiM...Habitat for Art" featuring the works of Pam Kehoe-Peterson & Jeremy Klonicki is in it's final days in the Kortman Gallery. First Friday will be a great opportunity to meet up with friends and see this fascinating show. Hope to see you this first First Friday of the New Year! 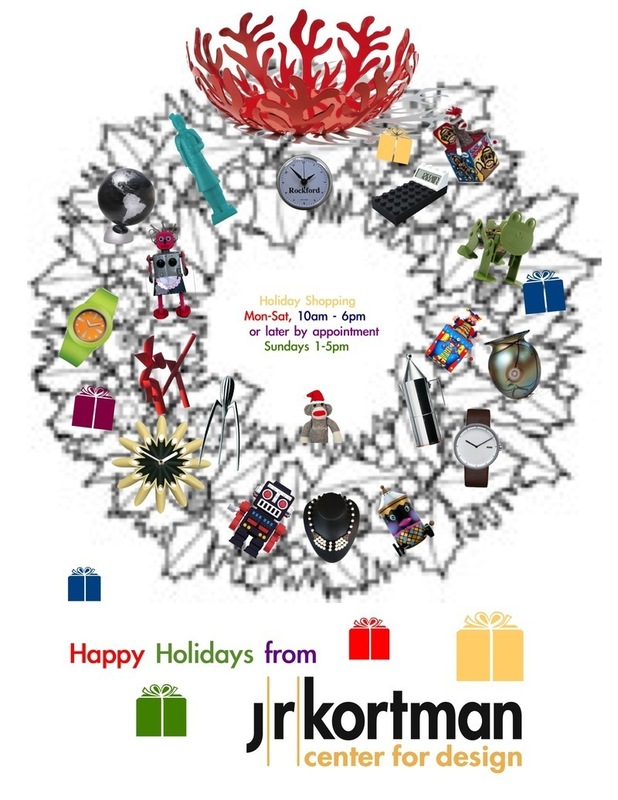 J. R. Kortman Center for Design is open 10am to 6pm thru Dec. 30 and 10am to 5pm on New Year's Eve...Happy New Year! 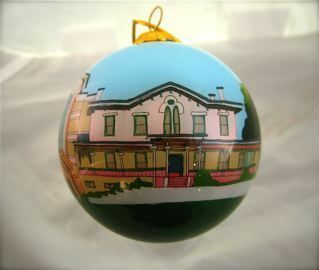 The Burpee Natural History Museum has been selected as this year’s addition to the Rockford Landmark hand-painted ornaments collection from J. R. Kortman Center For Design. Also new this year is a second-edition version of the Nicholas Conservatory under construction in Sinnissippi Park. “Burpee Museum and it’s famous resident Jane the dinosaur are certainly dominant landmarks, contributing greatly to Rockford’s cultural vitality,” said Doc Salfkosky, co-owner of J.R. Kortman Center for Design. “We had another edition of the Nicholas Conservatory created because of popular demand. The excitement is mounting since the spectacular superstructure of the conservatory is now a part of our river front landscape,” says Slafkosky. The Downtown Rockford design store/gallery has been creating new ornaments every year for more than decade. Also in the collection is a special edition of Memorial Hall, the Woodward Governor building, and the North Main Street Armory. 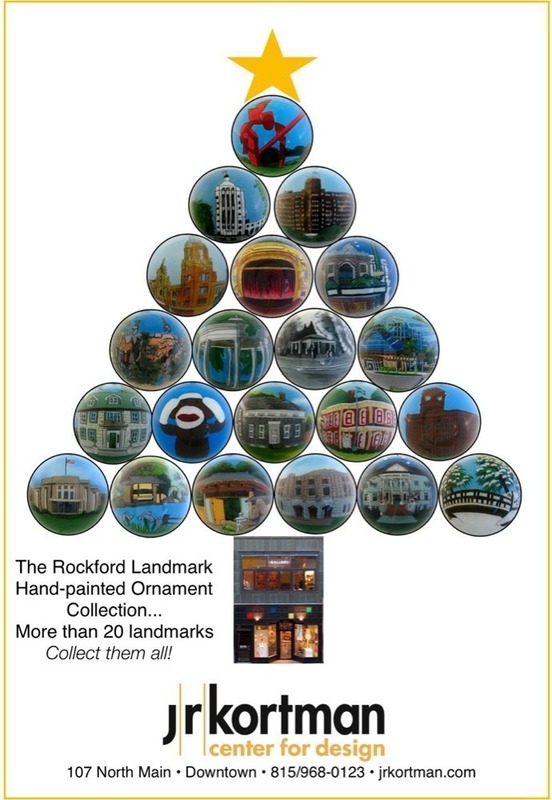 Other ornaments available in the Landmark Collection include “Guardians of the Rock” Sculpture by Theresa Agnew, the Beattie Park Gazebo, Sinnissippi Lagoon, the Rockford News Tower, the Faust Landmark Building, Coronado, and Midway Theater Buildings, and the Coronado stage, Sinnissippi Bur Oak tree, Old City Hall, and “Symbol” sculpture, the best selling ornament in the collection. In addition to the Swedish Historical Society’s “Erlander Home,” other historic houses in the collection include the “Limestone Mansion,” home to the Community Foundation of Northern Illinois, and the “Cobblestone House,” located at 2127 Broadway, one of Rockford’s oldest houses. All the Landmark ornament images are individually hand-painted on the inside of a glass sphere, utilizing an ancient Chinese technique originally applied to “snuff” bottles. Each collectable ornament is a miniature work of art. All ornaments are priced at $22 to $25 each.